For many individuals, mobility vehicles, like the mobility scooter or electric wheelchair, provide an incredibly valuable service. They are used both at home, in addition to be used away from home. Finding a way to easily and safely transport the mobility vehicle is important and while some people simply purchase a portable mobility vehicle, those who use their mobility vehicle on a daily basis will usually invest in a wheelchair lift. The portable mobility scooters and electric wheelchairs are available from most distributors. These kinds of mobility vehicles are designed to be very lightweight and transported easily. As a result, they lack many features and are generally much less durable than a non-portable mobility vehicle. Portable mobility vehicles can either be taken apart into manageable pieces or are designed to fold in a manner that does not take up much space. The heaviest piece will usually be only about 30 pounds, so many find that they can lift the mobility vehicle into their trunk without difficulty. If the scooter or wheelchair is only going to be used occasionally, then going with a travel scooter or folding wheelchair might be a good option, but for day to day use, it is better to install a wheelchair lift. Wheelchair lifts come in several different designs, but are generally classified as Internal wheelchair lifts or External wheelchair lifts. Internal wheelchair lifts are mounted inside of the automobile and the mobility vehicle is subsequently stored inside the vehicle as well. While this results in the loss of space inside the vehicle, it protects the mobility vehicle from the elements. For larger SUVs and Vans, internal platform lifts are often used. These extend a platform from the vehicle. When the platform is on the ground, the mobility scooter or electric wheelchair can be moved onto the platform, which is then raised back into the automobile. For smaller vehicles a crane lift is used. A harness is first attached to the mobility vehicle, the scooter or wheelchair is then hoisted into the automobile. Crane lifts are often used with cars, which could not otherwise use a platform wheelchair lift. External wheelchair lifts are also very common and use a design similar to that of an internal platform wheelchair lift. 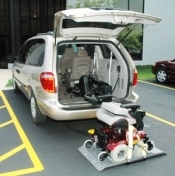 External Wheelchair Lifts are attached to an automobile’s hitch and the scooter or wheelchair is transported on the outside of the automobile, which is why they are often referred to as hitch mounted wheelchair lifts. Since the lift is attached to the vehicles hitch, it will not take up any space inside the automobile. The wheelchair lift can also be installed or uninstalled quickly in only a matter of minutes. These types of lifts do not require any major modification to the automobile, however since the mobility vehicle is stored outside of the automobile, it will be exposed to the elements. Many who travel long distances using a hitch mounted wheelchair lift invest in a scooter or wheelchair cover to protect it from flying rocks and the weather. Ensuring that a persons mobility vehicle can be transported easily and safely is important to millions of people all over the united states and many people use wheelchair lifts to make this task easier.